11/7/2016 Publisher’s note: Alex Sventitsky just informed us that the correct name of the power cord is Platinum HC and the MSRP is $999 per 6 feet. We apologize to our readers for any confusion. Alex and Nina Sventitsky are two of the most charming people I have met in the audio biz. If you want to get excited about music and getting the most musical enjoyment out of your system, just spend some time talking to them and even more listening to music with them. Year after year, show after show, they join with other like minded people to have some of the most fun rooms to visit and some of the best sounding rooms. 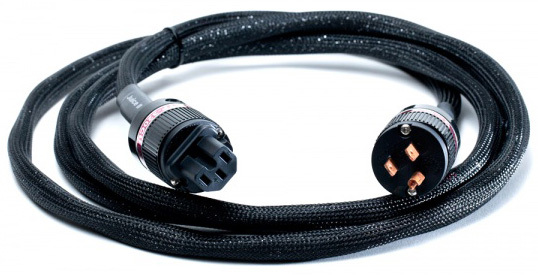 Back in 2014, it was my privilege to review the WyWires Juice HC Power Cords. I started that review by telling the story of an experience from decades ago where I came to understand that different power cords make a difference in how a system sounds. It was about the same time when my audio-bud, Steve Woolsey, called me one day. He was very excited about the difference that replacing his stock power cords with Powersnakes from Shunyata Research had made in his system. I think they were called Black Mambas and cost around $400. What was even more unbelievable was that they made a power cord called the King Cobra that was $1,000. I drove a couple of hours to Steve’s house to hear if they made any difference. I couldn’t believe it; they made a very significant difference, and for the better, I might add. So, I started down the power cord rabbit hole. Well, now it’s over thirty years later, and people are still making different sounding power cables and like everything else in audio they have gotten a lot more expensive. Though I know that to many it may seem completely crazy to even spend $500 for a custom power cord, it turns out that some high-end power cords may represent one of the best bang-for-the-buck changes you can make in your system. Now I have the chance to listen to the Wywires Platinum HC power cords. First, I want to say how thankful I am that they weren’t so thick or stiff to be dangerous of pulling light weight components off the shelf. They were flexible enough to be easy to hook up and position. WyWires use Litz wire in their power cord in an asymmetrical Litz bundle, which they say actually improves image focus, soundstage size and “openness” and helps to preserve the presence and scale of the original performance. The Platinum power cables sounded pretty good right out of the box, just slightly veiled and a little restricted, but not as much as most power cords without any time on them. They sounded considerably better the next day. The real improvement in their sound began after about 60 or 70 hours of use, and they continued to improve for the first week I used them. We all know you can’t listen to a power cord, but of course, you can listen to how your system sounds with different power cords. So from now on when I talk about how the Platinum power cords sound, you should know I’m really talking about how it affects the sound of my system. I used one of them on my Pass XA30.8 and the other on my DS Audio phono preamp. If you haven’t heard the difference a really good power cord can make in a system, you’re in for a nice surprise; some of these ultra expensive power cords cost in the five figures. These power cords from WyWires are impressive contenders in the world of ultra high-performance power cords and compared to most, they are a real bargain. I had really liked the way my system sounded with the WyWire Juice HC power cords. The sound with the Platinum is not that different, but you get more of all the positives with no negatives I could hear. My reference system produced a sound that was very natural with relaxed but exceptional detail. The overall sound had great scale with a big, spacious, holistic, three-dimensional soundstage. Both dynamics and micro-dynamics were exceptional probably due to how quiet, and clear my system sounded with the WyWires cables. The quiet background of my system when using the WyWires power cords also probably had something to do with how precisely placed instruments and singers were in the soundstage. The soundstage was also very wide and deep. Like some power cords costing more than twice as much, I could hear things placed within the vertical soundstage as well. The top end and midrange of my system sounded beautiful with these power cords. Cymbals, violins, flutes, and guitars sounded beautiful. The bite on trumpets and brass instruments sounded spot on; that is brassy without sounding harsh or edgy. Drums and string basses sounded very lifelike. I loved how I could hear the air around and within these instruments. The bottom end of the spectrum had real power and was well controlled with the Platinum power cords in my system. Compared to all the $2,000 power cords I’ve heard, the WyWires Platinum HCs have more of everything. The bass goes lower and has better impact; the treble is smoother with more sparkle; and the top-end is simply beautiful. Likewise, it portrays the soundstage as more three-dimensional with deeper, wider and even a taller image. The dynamics and micro-dynamics are exceptional. As you would expect, the noise-floor is exceptionally low still, which allows the listener to hear low-level ambient information. In my review of the WyWire Juice HC power cords I said; “Overall my system sounded natural, clear, and beautiful with the Juice HC power cords. I have not heard another power cord at anywhere near this price with which my system sounded this good. They are recommended at any price and very highly recommended at their actual price!” As good as they were for their price, the Platinum series moves into the world of truly high-end power cords and as I have already said for a great price, but don’t let that thought keep you from realizing these are great power cords at any price! Very nicely written –and insightful. It would have been nice to get a more detailed idea of the Juice HC vs. Platinum HC, along with the price of the Juice HC PC. I’ve heard many good assessments of WyWire cables. And Alex works on making the products better. It is very good that he is not another clone jacking the prices up to 6 or 8K ! Anyone who pays more the 30$US is a simple fool. Spend the money on speaker upgrade. Besides, anyone’s product that requires 50-80 hour “breakin” is cheating you. It has to make a 1,000$ difference as soon it’s connected. People are stupid. Everyone selling “snake oil cable and interconnects” cures is playing you for a “customer”(fool). Don’t trade you cow($) for a hand full of beans(power cords and interconnects).